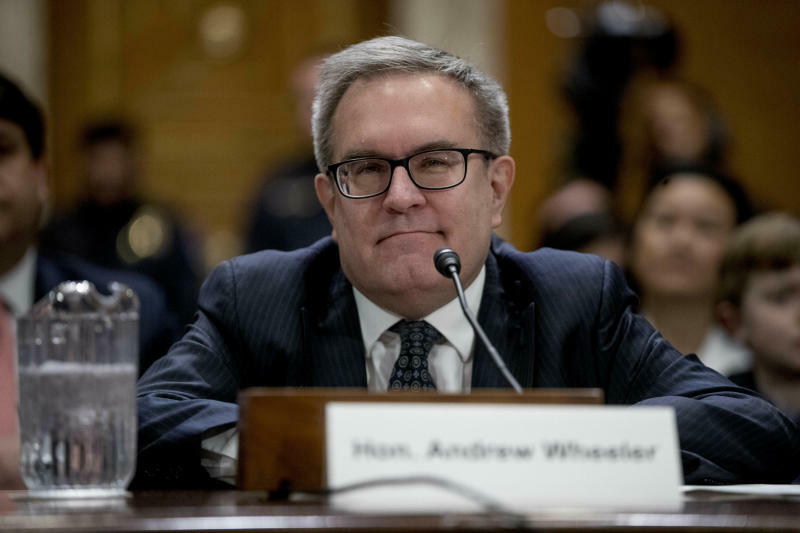 WASHINGTON (AP) — Unsafe drinking water, not climate change, is the world's most immediate public health issue, Environmental Protection Agency administrator Andrew Wheeler contended Wednesday. Environmental groups responded by saying the Trump administration was neglecting — or worsening — both health threats. Wheeler made his case for a shift in public focus in a CBS News interview that aired Wednesday, and in a speech later in the day in Washington on global water issues. Wheeler told CBS News that climate change is "an important issue" but that most of the threats it poses are "50 to 75 years out." He said it was "unreasonable" for 2020 Democratic candidates to pay so much attention to it. The Natural Resource Defense Council responded by citing the damage and deaths from hurricanes Harvey and Maria in 2017, and from back-to-back years of record wildfires in California. "Wheeler's claim is off by about 50 to 75 years," NRDC spokesman Jake Thompson said in an email. "Climate change and its impacts are here today, and getting worse soon." Wheeler's low-key assessment of any immediate danger from climate change is in line with that of the Trump administration overall, which is working to open more public lands for oil and gas development and to prop up the flagging domestic coal industry. President Donald Trump at times belittles the warnings on climate change coming from scientists in and out of his government. "Wouldn't be bad to have a little of that good old fashioned Global Warming right now!" Trump tweeted during a cold snap in January. The federal government's own climate assessment last year concluded climate change caused by oil, gas and coal emissions already is hitting the United States. Weather extremes such as flooding, hurricanes and drought "have already become more frequent, intense, widespread or of long duration," the report, compiled by scientists at EPA and other federal agencies, said. Climate scientists say the world needs to act quickly and sweepingly to curb emissions and stave off the worst extremes of climate change. Wheeler, a former coal lobbyist who has moved to roll back environmental regulations on coal since coming to EPA, said in his speech later in the day that water problems claim lives daily around the world. They "are the largest and most immediate environmental and public health issues affecting the world right now," he said. Wheeler listed EPA water initiatives underway, including his agency's new emphasis on reducing litter in water and a water recycling effort that would include wastewater from oil and gas fields. That idea is controversial. Environmental groups and some academics say not enough is known about the chemicals and other additives in the water that drillers pump in and out of the ground to extract oil and gas. Jon Devine, director of federal water policy at the NRDC, said the Trump administration's budget proposal earlier this month would cut funding for water systems, including for Alaska Native villages and in the Southwestern U.S.
"It's ironic that Wheeler would highlight the need to improve access to safe drinking water worldwide, while here at home he's working to reduce safeguards for drinking water sources," Devine said.